I was informed about a Darth Vader book being put together by Josh Frost, and thought hey, I could do a Vader illustration! Needless to say, THIS was the first image that sprung up in my head. Darth Vader's one of those people that's so awesome and menacing, he can look great no matter what he's doing. ...Even if it's stuff like this. Or this. Granted his origins are a bit shaky now that they've been unveiled... at least we know the end result was all-powerful. Enjoy! 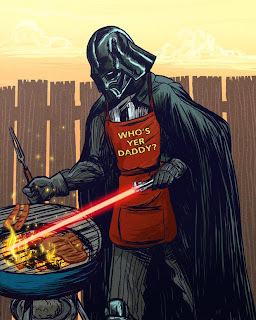 haha.. that's what lightsabers wehre meat for.